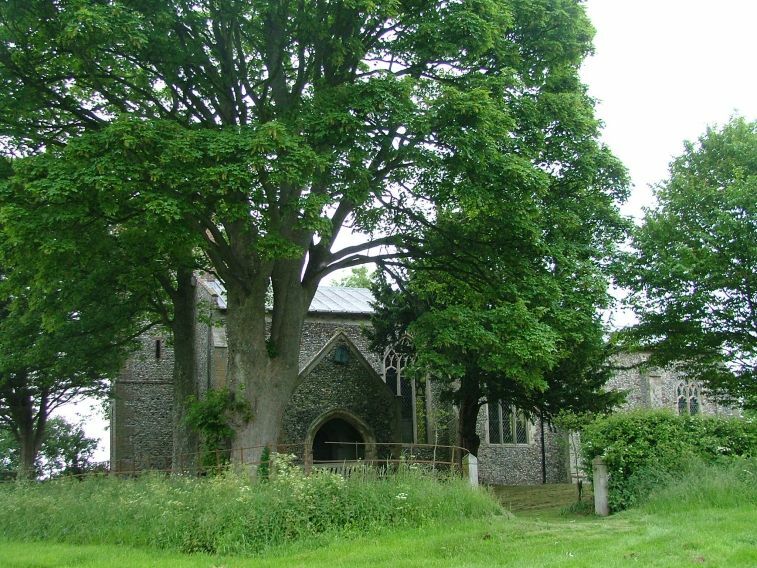 Not far from Wymondham, a path cuts off across the fields to where St Mary sits in its tree-shrouded graveyard. 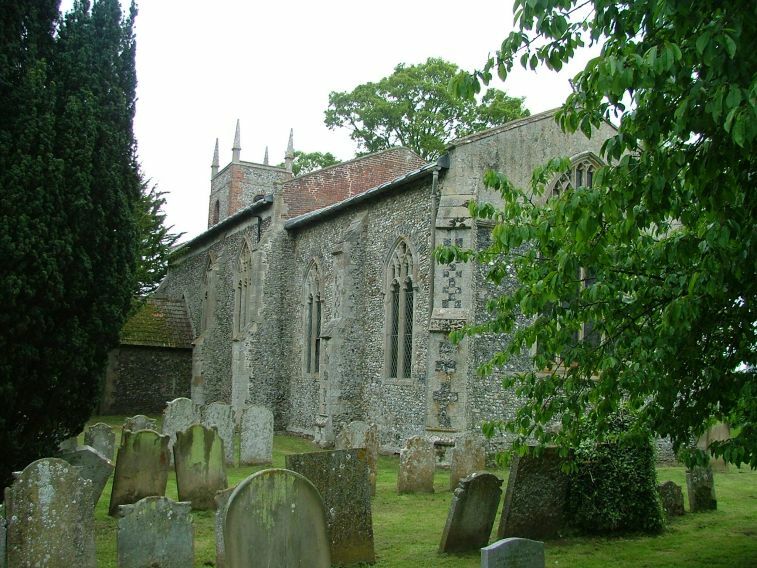 In summer, the graveyard is a riot of leaves, and all that can be seen from the road is St Mary's pretty and idiosyncratic tower rising above the churchyard hedge. You used to be able to drive across the field to it, but they've recently put in a new fence and gate, and so now you must walk. 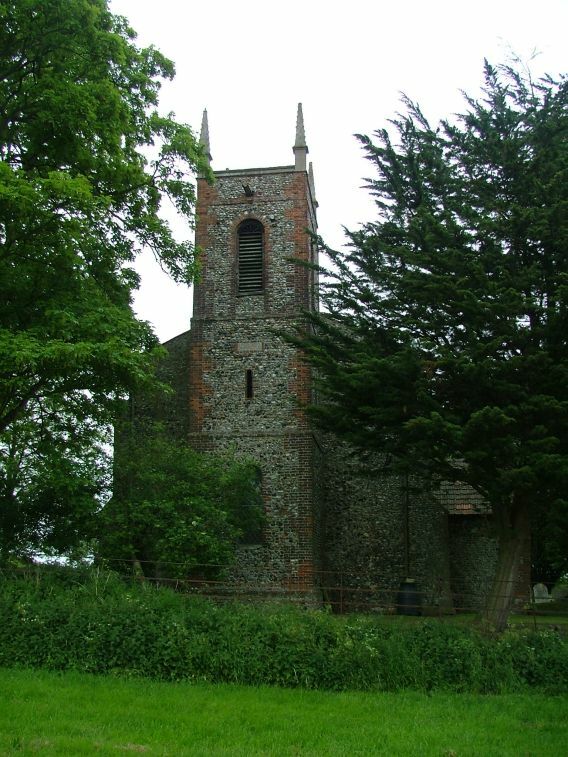 Unusually for Norfolk, the flint and red brick tower is early 18th Century, with the kind of pinnacles you might expect on a tomb or memorial of the period. Perhaps uniquely, the legend on the west face reads Vivat A Regina, a hymn to Queen Anne. 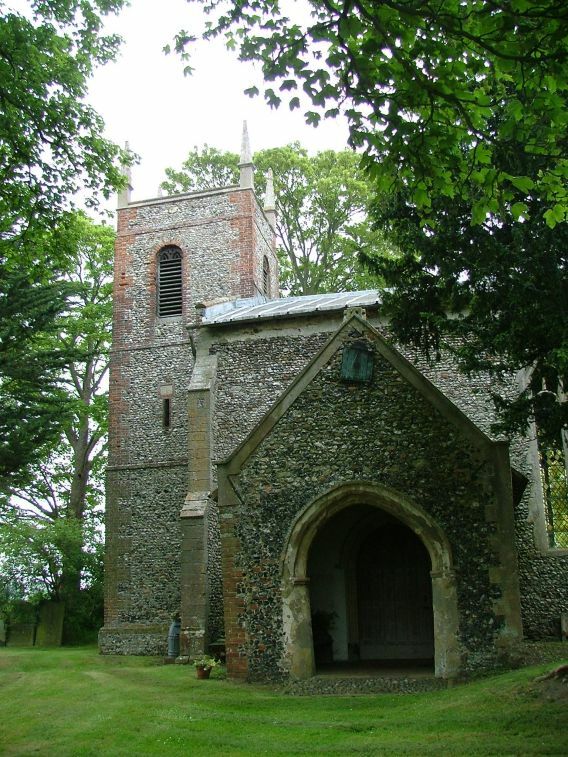 The setting so lovely, the walk so pleasant; but until recently St Mary was kept locked without a keyholder notice. However, there is now a keyholder listed, but in any case we came here in Open Churches Week 2010, and our walk across the fields was rewarded with an open door. We stepped into the surprise of a tall, open barn-like interior which is utterly lovely. I would not have guessed. There is a great feeling of more than a century ago: the church is pretty much all 19th Century inside, although early, with an open gallery at the west end, and suitably pre-ecclesiological in character, retaining the brick floor. Oil lamps line the walls and hang from the roof. One earlier survival is the set of image niches either side of the chancel arch, two or one side and one on the other, showing the site of medieval nave altars. 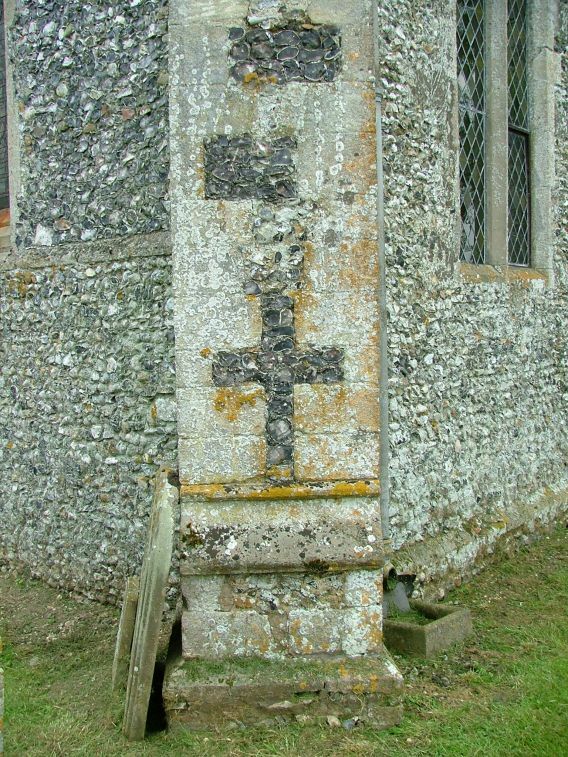 The four corbels above must have supported the rood beam. Beyond, the 1880s glass in the chancel adds a touch of gravitas. The silence of the fields all around contributes to this sense of insulated rusticity. In any rural church, the most moving details are often the simple memorial inscriptions in the floor. On 10th December 1656, at the height of the Commonwealth, Thomas Amyas's daughter Elizabeth his daughter and his wife Dorothy both died, presumably in childbirth. Their simple Latin inscription is beneath a simply cut geometric hour glass with wings. Nearby, a terser inscription recalls that Jarnegan Smyth died on 28 June 1691. In the aisle, the pre-Reformation brass inscription, asking us to pray for the deceased's soul, is all that survives of his memorial, but I couldn't work out his name in the dense gothic script. 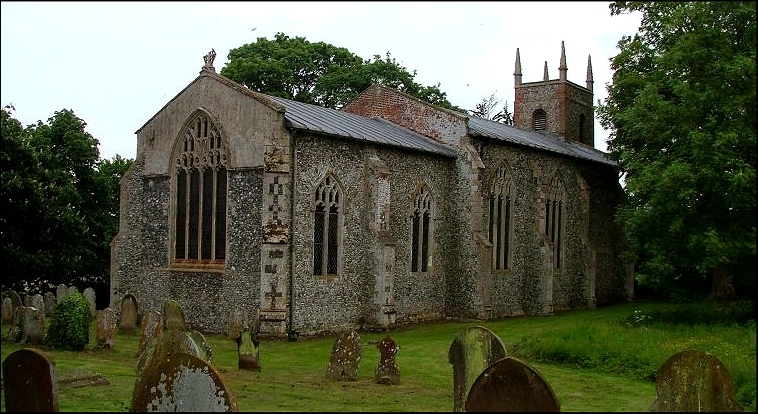 It was lovely just to sit here, away from the 21st century, communing with the ghosts of rural Norfolk. And then, the pleasant walk back across the fields.